Mixed berry cream cheese waffle cakes. <—- Next level. Breakfast? Brunch? Dessert? No matter when you take a bite, it’s ambrosial. I’m a Krusteaz ambassador, so I’m constantly playing and experimenting with all the mixes. And you, my dear friends, are the lucky ones with whom I get to share the results. I love ya like that. Start with a box of Krusteaz Belgian Waffle Mix. You’ll add a fresh strawberry/berry juice puree to the waffle batter along with some whole blueberries, and when you’ve crisped up some nice golden Belgian waffles on your waffle iron, lavish with cream cheese topping. My recipe is featured on the Krusteaz website. You’ll want it; trust me. This really makes me want some waffles. It looks delicious. My mouth is watering! Pinned, tweeted, and shared. Thanks for sharing at Merry Monday, hope to see you again next week! this looks so good – who doesn’t love waffles? thanks for sharing! Yes please! I’ll take one!!!! 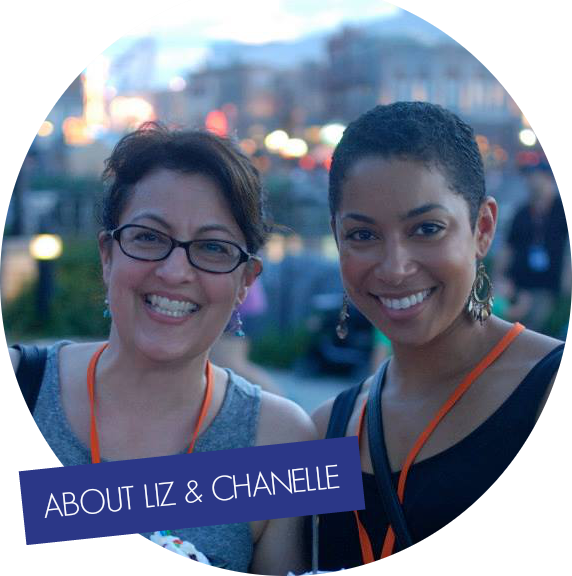 Thanks for sharing at our Living With Style Linky Party. Be sure to come back next week!! This looks pretty flippin’ delish to me. Pun intended. I’ve been threatening to get rid of my waffle maker because they keep sticking, but goodness, you might have changed my mind. Holy Toledo! Katy bar the door! Decadent! GREAT idea. I bet you could do so much with this. adding different fruit. I love waffles and have such wonderful childhood memories! 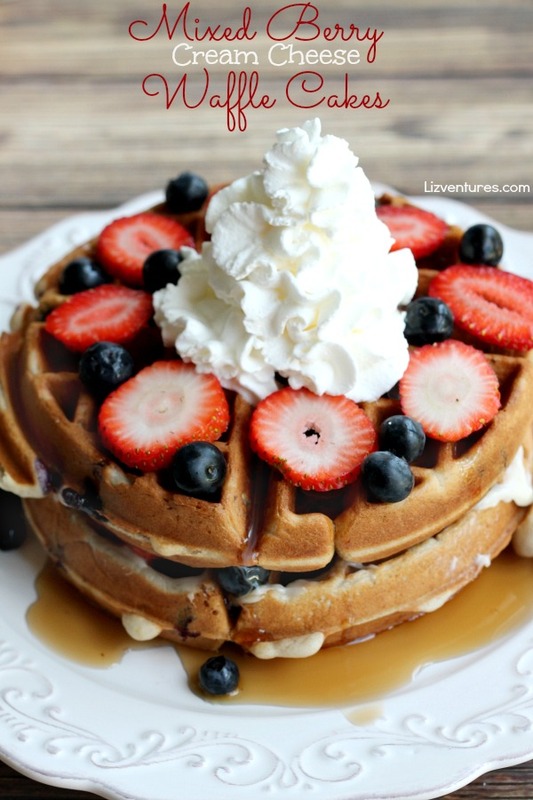 You berry cream cheese waffles makes me want to come through the screen and try these today! These look so amazingly good. I can’t wait to make them. I’ll be including them in my summer berry round up. These are beautiful and really showcase breakfast at it’s best! It’s definitely time for me to pull out the waffle iron for this weekend! With all the fresh berries available and cream cheese….I can taste it already! This just takes waffle to the next level! It looks so gorgeous! Pinned! Get in my belly!! These look fantastic. Cream cheese though? Who would have thought? Yum yum yum. I think these look amazing. They are like breakfast combined with dessert. Who can resist that? I know they would start my day with a smile! OMG, yum! I really need to buy a new waffle maker. Ours broke and I haven’t replaced it yet. Those look absolutely delicious! Does Krusteaz make a gluten-free version? This looks so good. I have to have this. OH how yummy! I am a HUGE fan of waffles and I am always looking for more recipes! I can’t wait to try this! oooooh my gosh! Those waffles look beyond delicious! My fiance would LOVE these waffles! my eyes just popped out of my face!!!! WOWZA, looks delicious! oooh… I wouldn’t mind waking up to this kind of breakfast everyday. The mixed berry cream cheese waffle cake looks delicious. This look like a wonderful breakfast/ brunch for a special day. I am going to pin the recipe to use for our anniversary breakfast. I haven’t made waffles in years! I don’t own a waffle iron anymore, but those looks so delicious it would be worth getting another. I’m not sure if that’s dessert or breakfast! Either way – it looks amazingly tasty. I love, love, love waffles! Now these looks delicious. I bet its fun to eat it with friends and family too. These look delicious. I don’t know why I never thought to add the berry puree to the batter. Ok, I guess it’s time to dust off the waffle maker and surprise the family with these for breakfast. Oh my! so love this dessert! Just looking at it, it made me crave! Love trying out new waffles and these look amazing! Sunday morning breakfast, here we come! This Recipe Looks So Flavorful, I Love Adding Fresh Berries To Waffles, I Must Try This Recipe ASAP! OUTSTANDING! So much better than the ones I make and anything with cream cheese is going in my belly! I could eat these for breakfast, lunch or dinner. I never get tired of something like this. Oh my! Those waffles look DELICIOUS!! I need them in my life ASAP as soon as I’m done with my 24 day challenge!! I wish someone would make these for me right now I am craving some waffles! I love the cream cheese and mixed berries idea. They would surely hit the spot for me right now! Yum! I love homemade waffles and these look amazing. I can’t wait to make and try them! We have a tradition of waffles for breakfast on Saturdays at our home. I’ll have to try this recipe this weekend! Ooh, that looks delicious! Waffles are one of our family’s favorite Saturday traditions. This is life changing! I never thought about cream cheese and waffles! What a delicious looking recipe. I love putting fresh fruit on my waffles. Usually the finished product doesn’t look anywhere as good as the picture on the box, but these waffles look AMAZING! I can just imagine they taste divine, too. Those look delicious. Berries and cream cheese…yum. Oh my goodness, those look so amazing! I love breakfast food any time of the day. I pinned this for later! Yum! I love berries in my waffles but adding cream cheese? I will try that nexxt time. Those look like an amazingly delicious waffles! The strawberries and blueberries looks so perfect and I’d love to have some right now! We were actually thinking of doing a breakfast party in the park for Mica’s family birthday party. This would be a great thing to serve! oh my! This looks so delicious a dn a great way to treat ourselves this weekend! 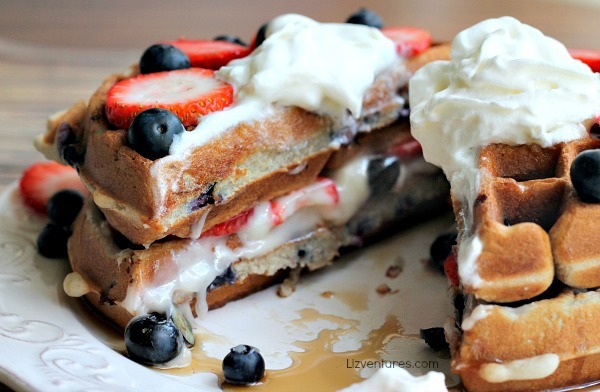 All of those berries oozing through the waffles are making me hungry! This would be a delicious breakfast! I love Krusteaz. It is my favorite brand. This is going on our list of breakfast foods to try! Looks amazing! My goodness, this looks so awesome and delicious. With berries & cheese combination, I am sure kids would definitely love this & I think this would be perfect for breakfast too. Would love to try this at home. Oh those look delicious. I bet it would also be good with fresh peaches or raspberries. Cant wait to try it soon! Oh my goodness! That is right up my alley. It looks so tasty I could just eat my computer! Wow, that could be a dessert it looks so good! We eat waffles for breakfast literally every day here so this would be such a great way to mix it up! I love berries, especially in the summer! These look so good but I don’t like cream cheese but I could substitute cream cheese for something else. My family loves cream cheese though so I will have to make these for them. Thanks for sharing. That is looking mighty spectacular! God I wish someone would make some for me! Omg!!! These waffles look absolutely amazing!!!!!! We do brunch every Sunday and this would be a great option! Waffles are my favorite next to French Toast. Make them like you did and they just might take first place…move over French Toast. This recipe looks beyond delish and perfect for a brunch I am having in August. What? That perfection came from a Krusteaz Belgian Waffle Mix? I actually have that on hand! I have to try this out! So delicious! This looks so wonderful. You always have the best recipes! These are amazing looking waffles! I think these would be great to make up for a Sunday brunch. Yum! A perfect Breakfast, Lunch or dinner!! My kids would love this too. This looks amazing. This is something my family will love to eat. I am excited to try making them. These look fabulous! What a great Sunday morning breakfast! I just got a waffle iron and am having so much fun finding recipes! These sound amazing. The cream cheese topping looks delicious. I can’t wait to try these waffles. Oh my these photos are making my mouth water. I am going to try making this as soon as i can. This looks so delicious. My kids would love to wake up to this on the weekend. I will have to make some and surprise them. Looks so wonderful. It sure would be a way to shake up the usual breakfast! Ok I saw this on pinterest from a friend that pinned it and it looks scrumptious. I cannot wait to try this. Liz you’re going to make me fat! You post the best recipes, can you come cook for me? Oh my goodness. This looks so yummy. I want some right now. Darn diet. My children really like waffles. These look really good and I am sure they would love this recipe! Thanks for sharing! Oh my goodness, now this is some sort of deliciousness. I mean, I love waffles, but add in all these other goodies? Perfect. Thanks for sharing. Those look amazing! Makes me want to dust off the old waffle maker! I’d love more opportunities to bust out my waffle maker! Fresh fruit and waffles are a perfect combo! Oh that looks so amazing. I would love to try this brand! i bet those ingredients are all amazing together. Looks amazing! I know you can’t see me but my mouth is wide open from the shock factor at how amazing these waffle cakes look. We have a great waffle maker so you can guess what will be going down for breakfast this weekend! I have never thought about putting berry puree in waffles before! That is a GREAT idea! I can’t wait to try this! I’ve always had such a love for waffles, but I rarely make them at home. You’ve convinced me to give it a try with your beautiful photos. Those berries and cream cheese – yum! Make me Hungry just looking at the pic! Have been a Fan of Krusteaz and used there products for years.. Goind to have to make some of these. Oh yummy! I wish I had a waffle maker. I’ve always wanted to make my own! This looks so tasty and delicious. I love the blueberry in my waffle cheese cake. It does look delicious and decadent. It makes me want to eat it for breakfast, lunch and dinner! These look delicious. I always love anything with cream cheese. Oh.my.gosh. These look amazing!! Does Krusteaz have a gluten free version yet? They have a gluten free pancake mix which you can use to make waffles! Waffles are such a versatile breakfast food. I would eat waffles this way for any meal of the day. This looks so good! I love waffles, especially when we do breakfast for dinner. Wow those look amazing and delicious. I love berry season. Wow that looks so yummy! This would be a great alternative for a birthday cake.! These waffles look delicious and the double decker, wow that looks like a lot of food. Liz, These look absolutely amazing. I think they would be delicious for dessert. Well doesn’t that look mouthwatering!!! Your display/presentation is beautiful! This looks like the perfect dish for Sunday brunch. You could even spice it up a little bit and add some chicken to make a version of chicken and waffles. These look so good. Genius is the addition of cream cheese! I’ll have to make these soon. Alright, you’ve sold me on getting a waffle maker! This looks so beautiful and delicious, I would eat it for dessert! My family was so sad to find out some of our favorite stores (like Sam’s Club) quit carrying KrustEaz. It is one product I don’t mind paying extra for because it is so good! The difference in price will be made up from the lack of membership fees for Sam’s. I now get it at a local grocer’s. The recipe is awesome. 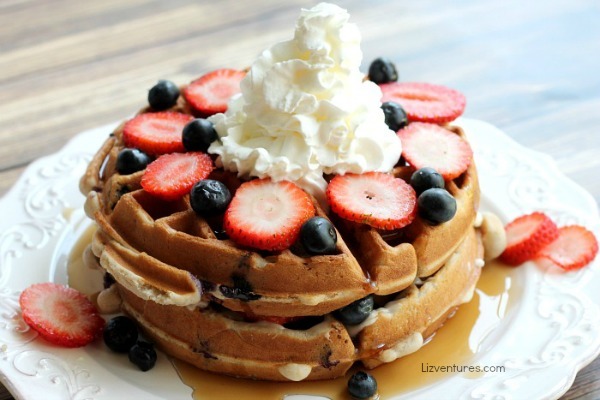 I absolutely love waffles with berries! Adding cream cheese is even better! I can’t wait to make these! Same here! I am a cream cheese freak. This sounds divine. This looks amazing. I am a huge waffle fan and adding cream cheese and berries makes them even better. Oh my … this looks so delish! My family loves waffles – we will have to try this recipe. These waffles look amazing! So need to make these. Yum! That looks really good. We don’t ever make waffles at home but maybe if we top it like that we would more often! This looks SO good! I love sinful breakfasts on the weekends! That Belgium Waffle mix looks like it produces a pretty tasty breakfast. My mother and I love whipped cream and berries on waffles. I’m so in the mood for breakfast now. My kids would jump for these they would see them and think dessert! These look amazing and I bet just taste delicious! These look so delicious! I love the waffles and berries combo! I am drooling! That looks amazing! Would have made a great 4th of July treat too! Wow that looks amazing! Forget breakfast looks like dessert! I came back to grab the recipe and I have to agree with you. This does look like dessert and I’m ready to make some. Absolutely, positively YUMMO! I love the “cake” you made with these waffles. That fruit and the cream cheese filling looks delectable. Mmm. . .we do have a box of Krusteaz, so I might have to try making this this weekend. It looks dreamy, and I am sure the family will enjoy it! Thanks for the idea! My mom would love these I am going to have to make them for her. This looks like an incredible breakfast! I would love to put this together for my family this weekend. That is absolutely fantastic. I love fruit on my waffles, but this recipe takes that idea to an entirely different level. Yum! Crazy what you can do with ready-made waffles, some frozen fruit and whipped cream. looks restaurant quality good. Belgian waffles are my life!! so crispy outside yet soft inside – I can’t! The blueberries on yours would be gobbled up by my kids but bring on more strawberries! I’ve never tried making my own Belgian waffles at home though because I didn’t know there was mix for it. Good timing since I’m going grocery shopping today! These look so delicious. I love waffles since they feel like a dessert, even if I’m eating them at breakfast. I need this delicious berry deliciousness in my life! Yes, I know I said delicious twice! That’s how fantastic this looks! These waffles are mouth watering. I need to buy a box of Krusteaz Belgian Waffle Mix. My kids will love this. I. Love. Waffles! You had me with the blueberrie! And a delectable dessert too! Way to go Liz!! I am officially in Heaven! I love plain waffles with syrup, so this… This is like the waffle end-all be-all for me. Yum! These look amazing! I never used to be a waffle fan but lately I have really been loving them. This looks amazing. I love Krusteaz waffle mix. We have a HUGE bag in our pantry! These truly are a ‘waffle wonderland’! A decadent breakfast or a fresh dessert?! Both I think. These look so summery and delicious Liz. Everything is better with cream cheese! Those waffles look so yummy. I could really go for some now. I love the idea of adding berry puree right to the batter, I bet that makes delicious and moist waffles! We make waffles a few times a month here and I’ll definitely try this recipe out. They look amazing! OMG this looks amazing. We are a breakfast family for sure. We even have it for dinner. I rarely eat breakfast…but if it looked like this, I sure would! Wow! I’m a fan of waffles though I haven’t got that courage to try out these mouthwatering flavors. I’m just too afraid that it would taste different from what I expect. I’m such a coward trying out new recipes. This is fancy and delicious! I am suddenly craving for some waffles after looking at your photos. That looks sooooo gooood. So you don’t have to sweeten the cream cheese? Those waffles look absolutely amazing. I would love to try them and I’m going to share your recipe with my daughter because she makes waffles even more than I do. We are a waffle loving family. Thanks for sharing, I can’t wait to try these. Mixed berry waffles alone sound amazing but the addition of cream cheese is just so yummy! I seriously love cream cheese in everything but hadn’t thought about adding it to my waffles. I will be trying this recipe for sure! I love waffles, but I have never made waffle cake before. I have to give this recipe a try, because it looks just so delicious! I can definitely see myself sitting down on the outside patio, early in the morning, with this plate full of waffles. What a great way to start any day! You did an amazing job with those (great pictures too!). Oh wow we would all love this! 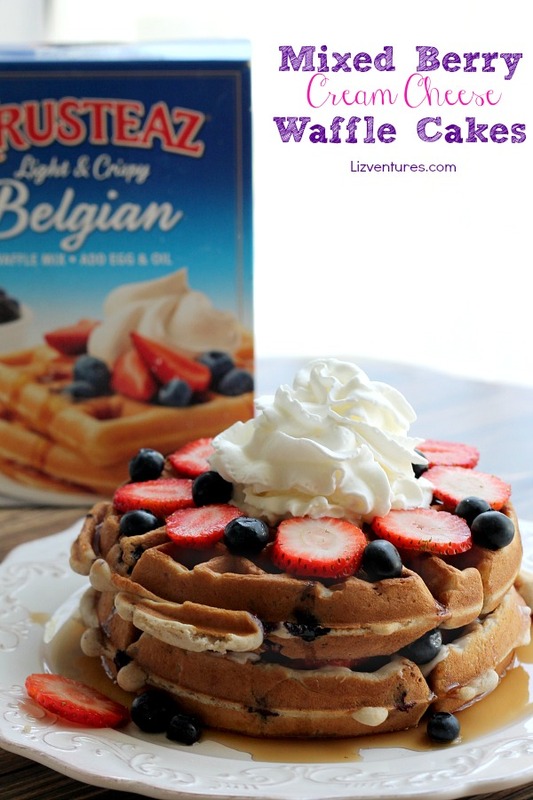 The waffle cakes would be fantastic for our brunch! I’ve had cream cheese on waffles before and it was amazing. These waffles would make a great Sunday brunch meal. Cream cheese and berries always work well together. Your waffle is mouth watering! I like waffles filled with stuff, especially whipped cream! Yum! You always have good meal and dessert ideas! That looks so delicoiius! I love waffles and this looks like a great way to eat them.